Coming from behind was on the #10/11Terriers’ script again last night at Agganis Arena as BU erased two Providence one-goal leads to earn a 3-3 overtime time and take three of four points from the Friars. BU’s third line produced the team’s only lead of the night late in the opening period when Matt Lane raced down the wing and fired a hard shot on goal and Ben Rosen banged home the rebound. Providence responded a minute later with a power play goal. Friars forced a turnover early in the second period to take a 2-1 lead, but BU knotted the scored on Matt Nieto’s powerplay goal off a Matt Grzelcyk pass. The junior forward, who has four goals and five assists in the last six games, earned first-star honors. Providence went ahead again in the first minute of the third period. BU stepped up the pressure and produced the equalizer 13 minutes later on Danny O’Regan’s (photo) wrap-around goal, his ninth of the year. In overtime, BU outshot PC, 6-0, and came close on a three-on-one and then in the final seconds when O’Regan’s drop pass gave Nieto an open shot that Providence’s Jon Gillies snared as time expired. 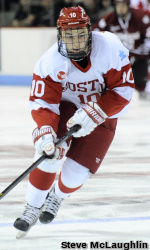 Senior Ryan Santana filled in for injured right wing Evan Rodrigues on the O’Regan line and performed well, but is likely to return to RW4 soon as x-rays of E-Rod’s hand proved negative and Coach Jack Parker indicated he could return to the lineup again UMass next Friday. O’Regan and Nieto each had a goal and an assist and now have 22 and 18 points respectively. 2013 recruit Doyle Somerby scored his first goal of the season on a power play as top ranked Kimball Union (20-1-0) battered Exeter, 8-0. The 6-5, 232-pound defenseman, a 2012 fifth-round Islanders draft choice, has a 1-13-14 line in 20 games and has been the Wildcats' top shutdown defender. Brandon Yip scored his first goal (video) of the season for Nashville, but his former Terrrier linemate, Nick Bonino, and the Anaheim Ducks came away with a 3-2 win. David van der Gulik scored his 12th goal for Lake Erie in a 4-3 win over Toronto. Alex Chiasson, with a pair of assists in the Texas Stars’ 4-1 win against San Antonio, has nine points (4g, 5a) in his past five games. Adam Clendening assisted on a pair of goals, including the game-winner in Rockford’s 4-3 win over Oklahoma City. #5 Terriers take on New Hampshire this afternoon at Agganis Arena with puck drop at 3 p.m. BU, which brings a 11-game unbeaten streak (9-0-2) into the game, last lost on Dec. 9 to the Wildcats, 4-2, in Durham. Member of the Women’s team were at Agganis Arena last night selling pink pucks to raise money for Skating Strides against Breast Cancer, which Women's Hockey East teams are supporting for a seventh season.